As I mentioned last week, I've been reflecting a lot on goals lately. Many people ask me how I get things done. Part of it is purely tactical and related to my work style; I just happen to be good at mapping out a workflow and powering through the steps needed to get from point A to B. 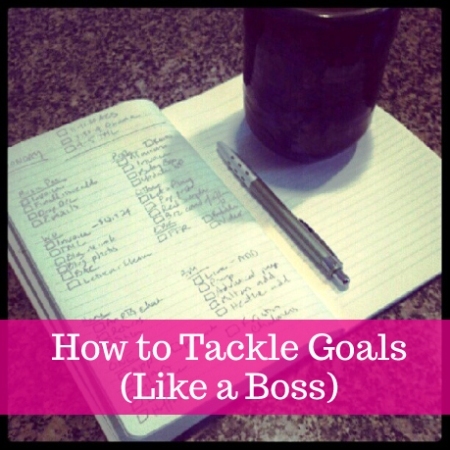 But there are a lot of other things I've learned along the way that help me tackle goals (like a boss, in fact...). I wanted to share them with you today. 2. Garner inspiration from your network. Seeing other people doing awesome things (in an observing and supportive, not jealous, way...seriously, mojo matters!) is one of the best ways to motivate you to tackle a goal. If you want to jump in to a community of goal setters, check out what my friends are doing at Go Mighty; you can share and tackle goals virtually, or head to camp and garner in person inspiration. I have attended both Camp Mighty and Mighty Summit; both were awesome. 3. Talk to confidantes. Outside, knowledgeable counsel can be invaluable. Recent conversations with my dear friends Jessica Ashley and Meagan Francis have been wonderfully helpful in giving me the nudge to tackle some professional goals that I've been sitting on for a while. 4. Write it down. There's so much power to writing down your goals. I do it via paper notebooks (inspired by my co-author Asha Dornfest, who is all about her Moleskine journals), electronically via Wunderlist, and in editorial form via this blog on occasion. Your words can be as private or as public as you want. Just write it down. 5. Enlist your family. When you're going to tackle a big goal, it usually takes time and effort. And the reality is, this usually impacts people around you. 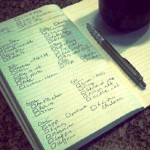 I've realized that it's not fair to my family for me to take on and tackle big goals in a vacuum. Now when I'm considering something big, I talk to Jon (and Laurel, if it impacts her too) first. The family system is a whole lot happier this way. 6. Stack up previous competencies. Whether it's races run or projects completed, it's OK--no, good--to pump yourself up and remind yourself of your competencies when you're preparing to tackle a new goal. It might give you just the confidence boost you need on a low day. 7. Delegate. Back when Asha and I were writing Minimalist Parenting and I was in the middle of a major professional meltdown, Asha gave me this sage advice: focus on the things that only you can do and delegate wherever else possible. I've carried that mantra with me ever since and found that delegating the little day to day things that eat up precious time have freed me up to tackle goals. 8. Don't let mishaps derail you. Perfection is overrated. Don't let mishaps derail your goals. For example, my first 10K didn't go exactly as planned, but I learned from my stumbles and am ready to move forward. 9. Take the plunge. It may sound trite, but at some point, just do it. Don't let fear drive you. In the last couple of weeks, I made two new hires (goal #1 here) and signed up for my first half marathon. Regarding the latter, yes, I haven't run 13.1 miles. Ever. Not even close. But it's time to take the plunge!